Hello! 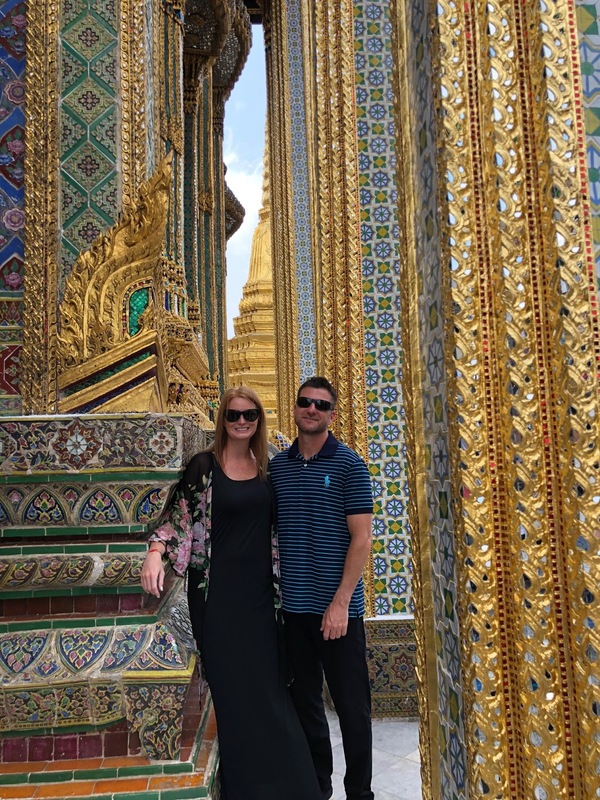 We are back from Thailand, what an amazing trip that was and I have so much to share. We started off our trip to in Bangkok, arriving at 5:30am after a 27 hour flight (including layovers). Luckily, we slept fairly well on the plane and thanks to our amazing airbnb host, we were able to get in the condo at 7am. 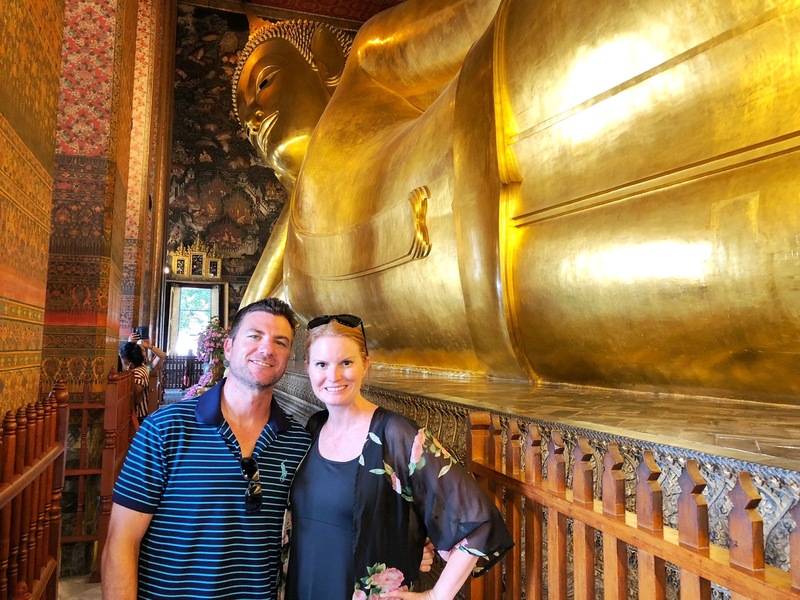 After a quick breakfast and shower, we headed off to visit some of the Temples in Bangkok. 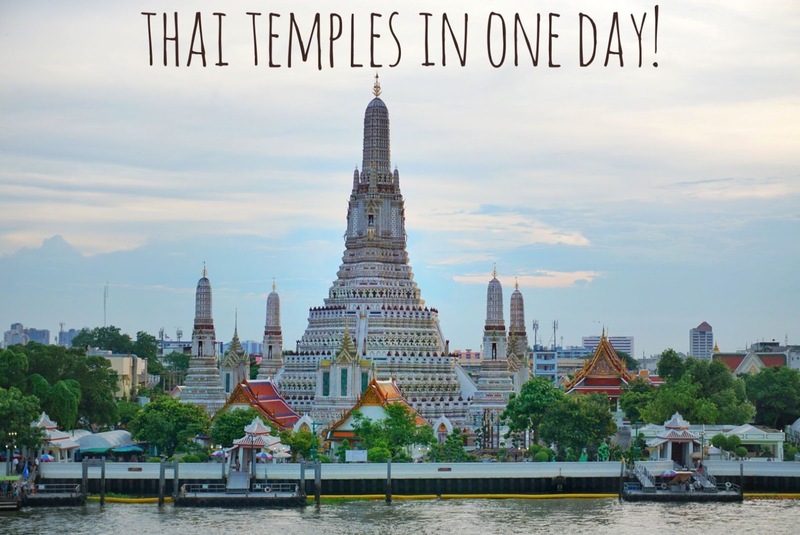 I honestly didn't think it would be possible to arrive in Bangkok, check-in, shower and do the three main temples we wanted to visit within one day. Not only did we manage it, we had time to spare! The itinerary below was based on us being able to walk from place to place. When I planned out our agenda, I based it on us not being jet lagged. We were all doing very well considering the time change. However, what I didn't account for was Bangkok traffic. My lord, I will NEVER EVER complain about traffic in the US ever again! 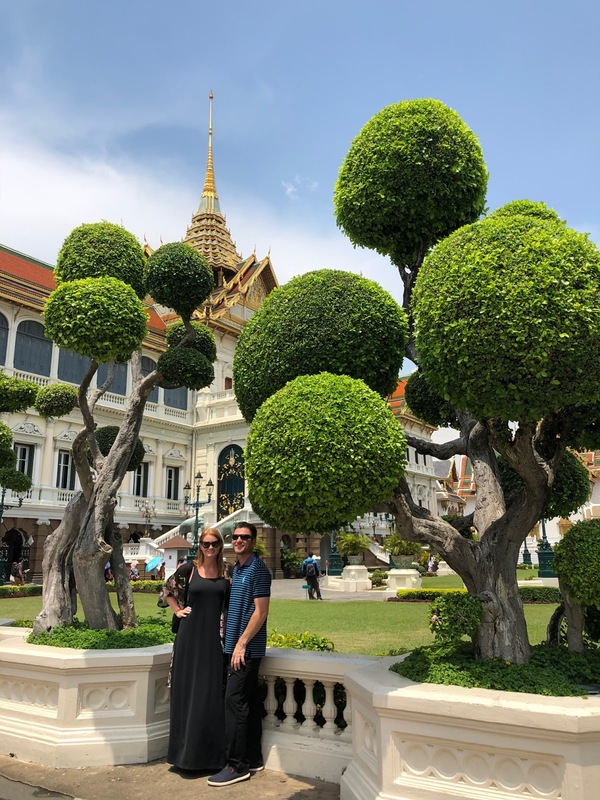 After a 45 minute Grab ride (Asia's Uber), we finally made it to The Grand Palace. We got out of the car and jaws started dropping and weren't inside yet the grounds yet. We each paid our 500 baht entry fee (about $15 USD each). 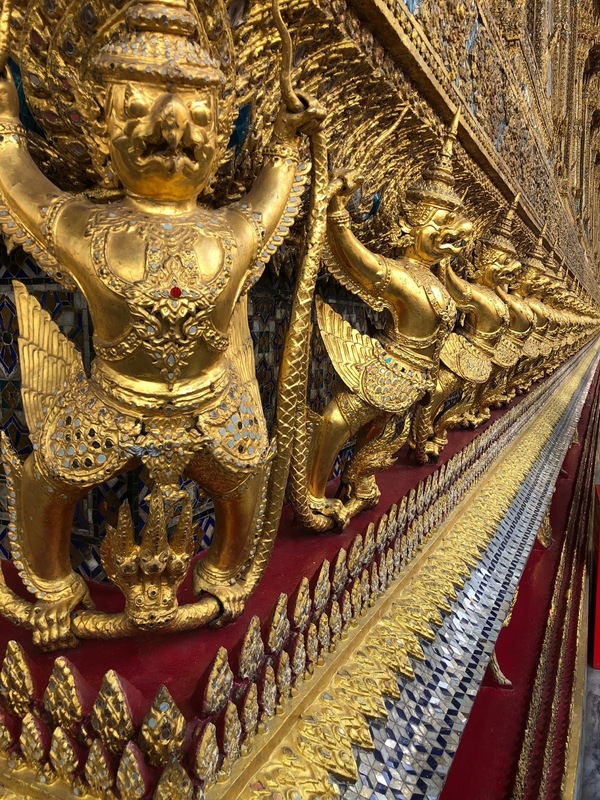 Grand Palace was the highest priced temple we visited but so worth it. It was also the busiest temple we visited. 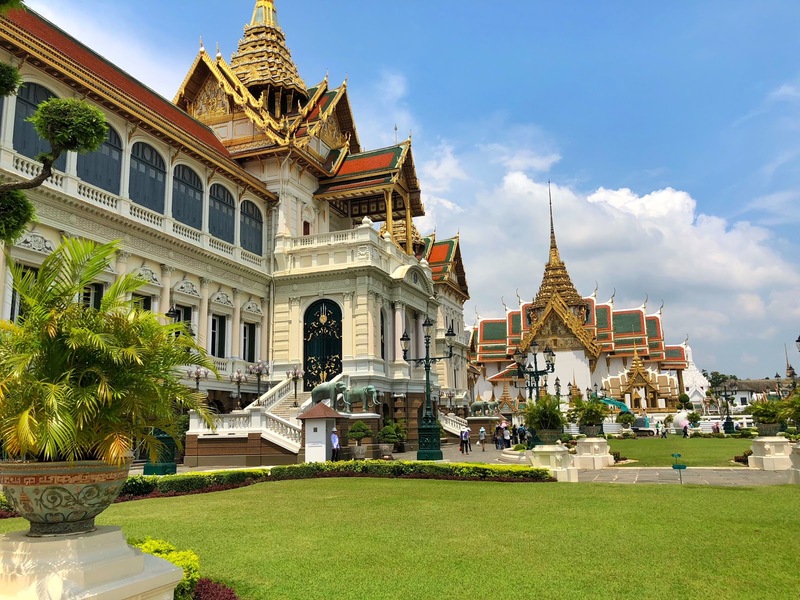 Grand Palace is home to the Emerald Buddha but sadly photographs were not allowed. However, we took a ton of pics. I never saw so much gold in my life. Everything was sparkling and gorgeous beyond words. Photos do not do justice! 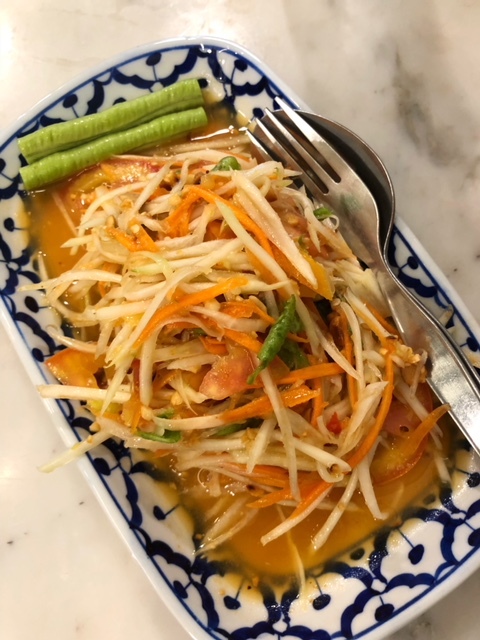 Following Grand Palace, we stopped for lunch at Home Cafe Tha Tien, which is across the st. from Wat Pho. This down to earth restaurant is highly rated on Trip Advisor. Everyone in our party agrees that it was one of the top meals we had on the entire trip. Each couple got a starter, main entree and drinks. It set us back a total of $7.50 each couple. 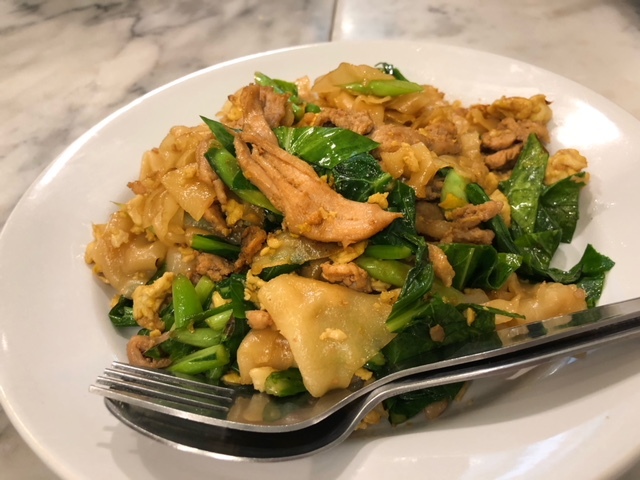 I was very happy with my decision of Pad See Ew and Papaya Salad. 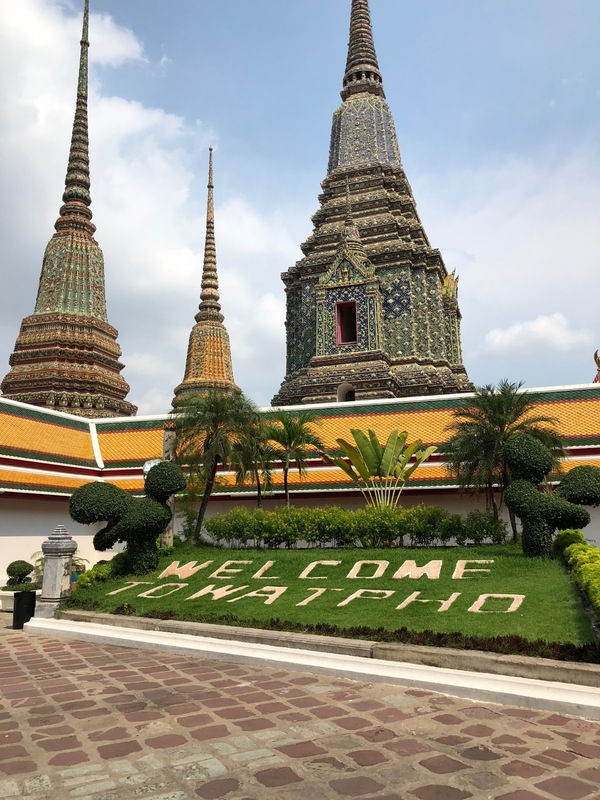 With full bellies, we headed across the street to Wat Pho. 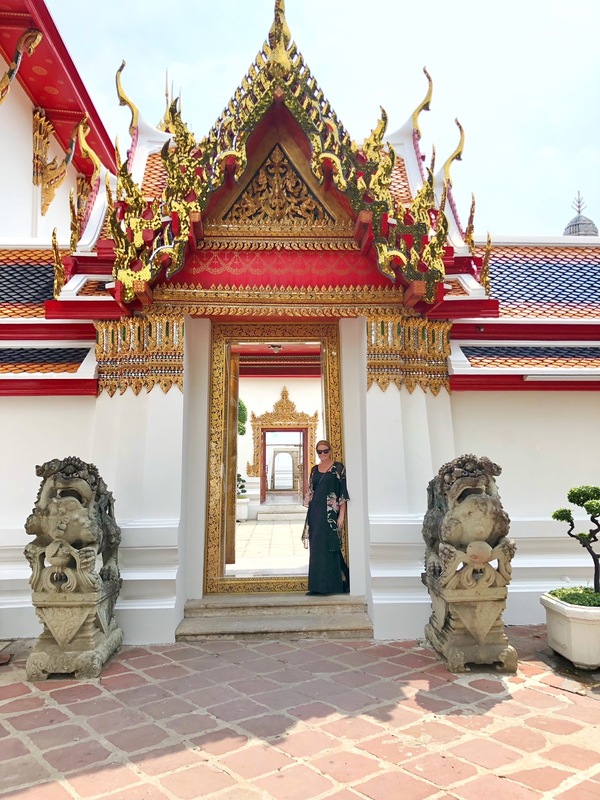 If you're planning a trip to Bangkok, I am sure you have already heard of the scams - that people will come up to you and tell you the temples are closed. This was tried on us and we smiled and kept walking. The temples rarely close so don't fall for it. 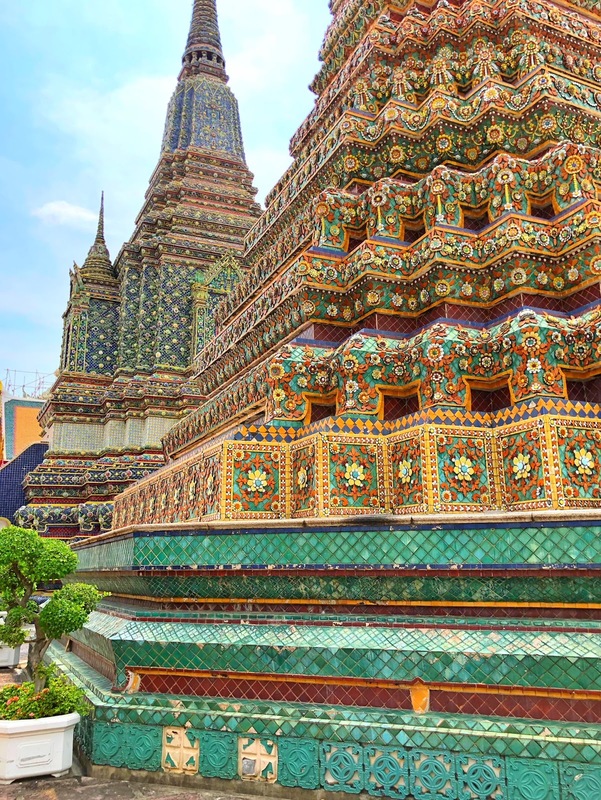 Of the three temples we visited, Wat Pho was by far my favorite. 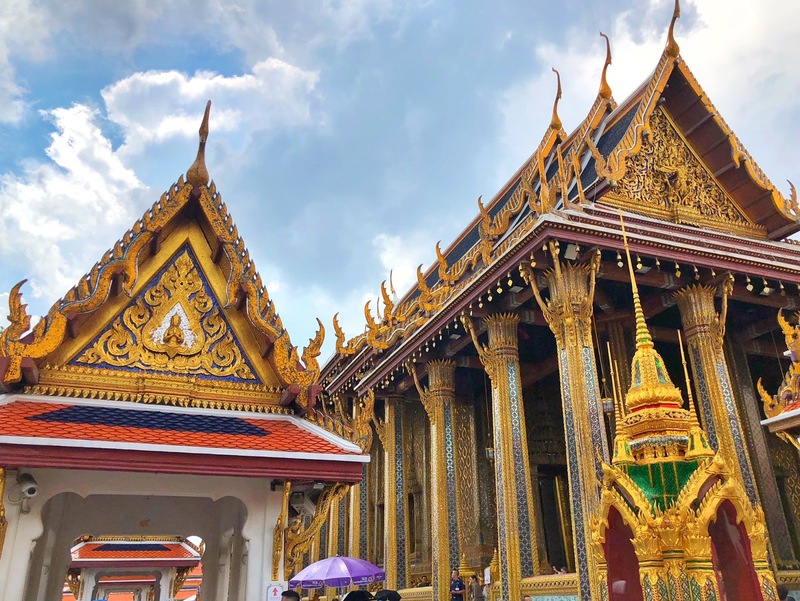 It wasn't nearly as crowded as Grand Palace and it was stunning. The entry fee here was 100 baht a person ($3 USD). 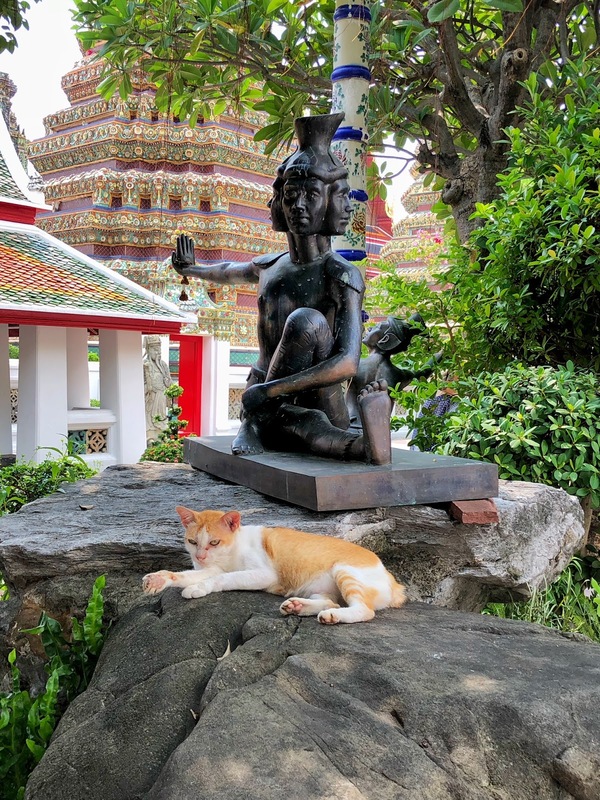 Wat Pho is also home to the Thai Massage school. I had my first (of many) massages at a temple. I will tell you, this is not the traditional massage you're used to in America. You lay on a thin mat in an open room. You are clothed but it is a little awkward having so many people around you. Once you get over that, it's a fantastic experience and I strongly suggest it. 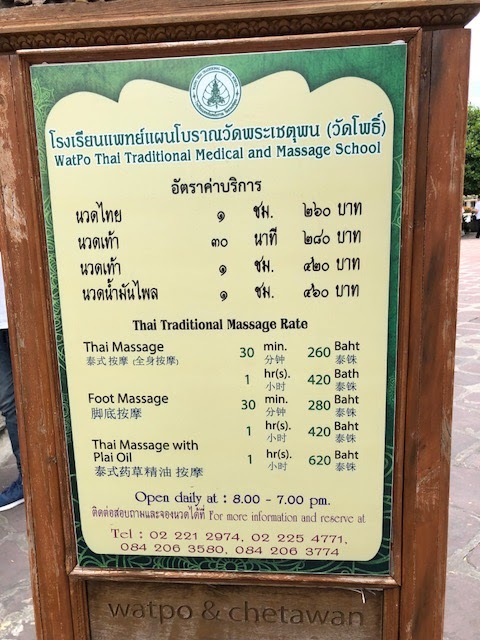 Both my husband and I opted for the oil massage which was 620 baht ($19 USD). I about flipped when I saw cats walking around the temple. Little did I know, my entire vacation would be filled with kitties! This helped with my homesickness (I only facetimed Baloo 10 times). With your 100 baht ticket to the temple, you get a free bottle of water which was much appreciated given how hot it is in Thailand. 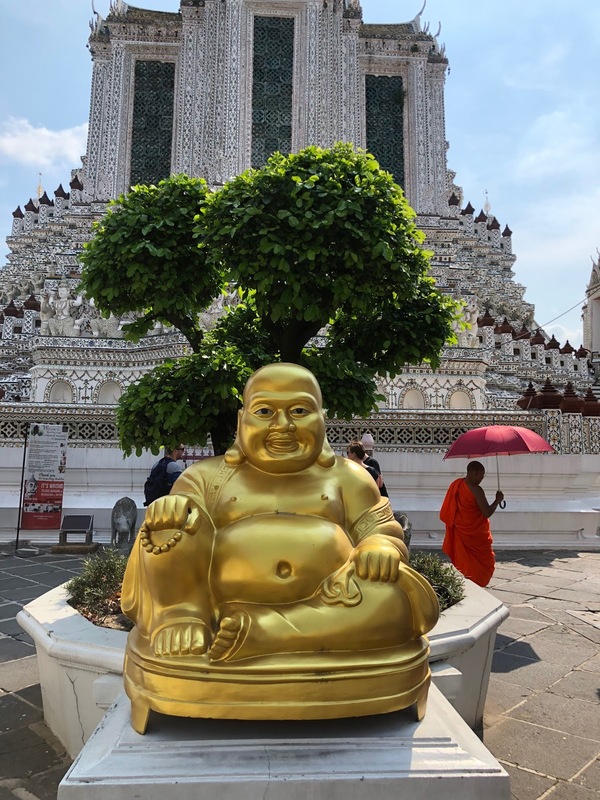 At Wat Pho, we visited the temple of the reclining Buddha. Words cannot express the beauty. The detail everywhere you looked was a bit mind blowing. I didn't want to leave! We left Wat Pho and headed down the street towards the pier. There were tuk tuks everywhere but it was a very easy and quick walk. 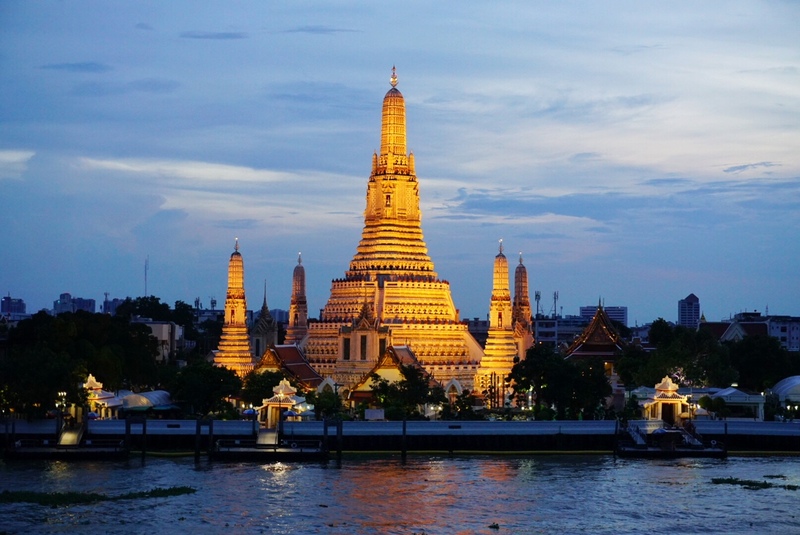 You have to take a short ferry (literally across the waterway) to access Wat Arun. The boat ride was 3 baht each way (10 cents USD) and was a very quick ride. 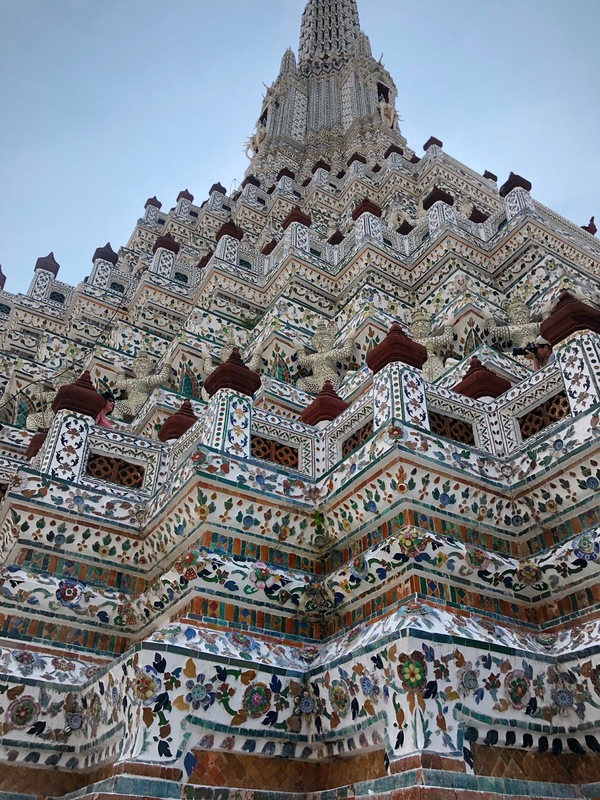 The price to enter Wat Arun was only 50 baht ($1.50 USD). 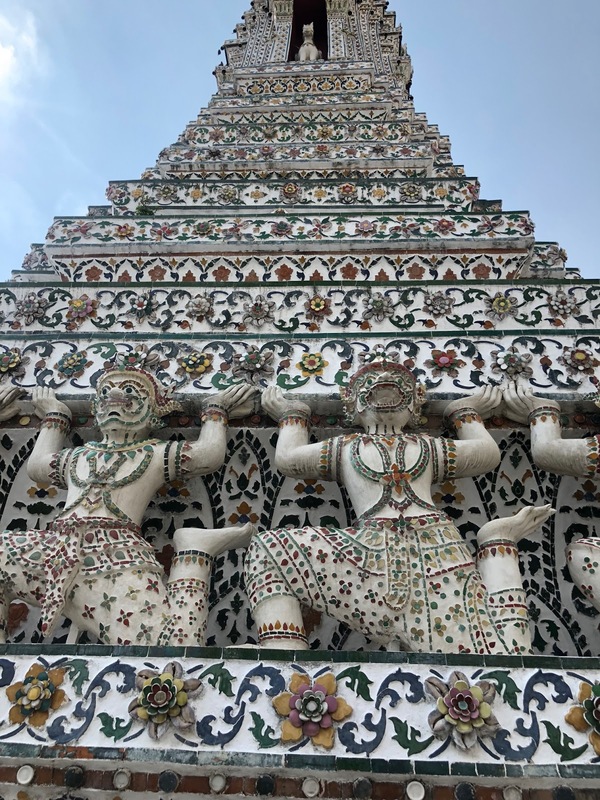 Wat Arun was the smallest of the temples we visited but the details are something you must see in person. It was truly breathtaking. Once we were done walking around Wat Arun, we walked around the marina and decided it was cocktail time. We were a few hours earlier than expected and could have technically fit another temple in if it weren't so hot outside. The heat and time difference was finally hitting us. 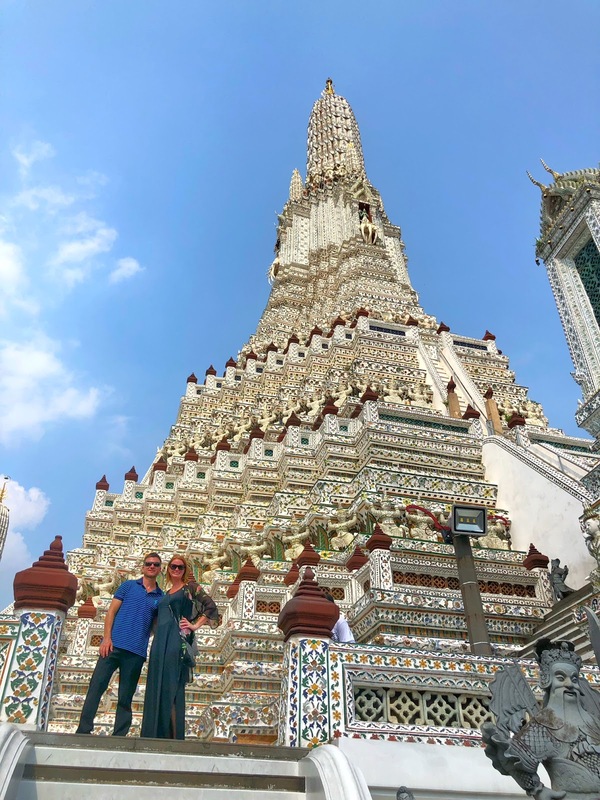 At 5:00, we headed to The Amorosa Bar at Arun Residence to watch the sunset overlooking Wat Arun. It was spectacular and I suggest seeing at least one sunset here! Finally, it was time for dinner. A friend suggested we dine at Err, which was very close to where we were. They had crazy craft cocktails and the food was pretty good. I won't say it was the best meal we had in Bangkok but due to the proximity of where we were, it was a nice night out. The temples all have dress codes, some stricter than others. Ladies need to have their shoulders covered, with long skirts or pants. 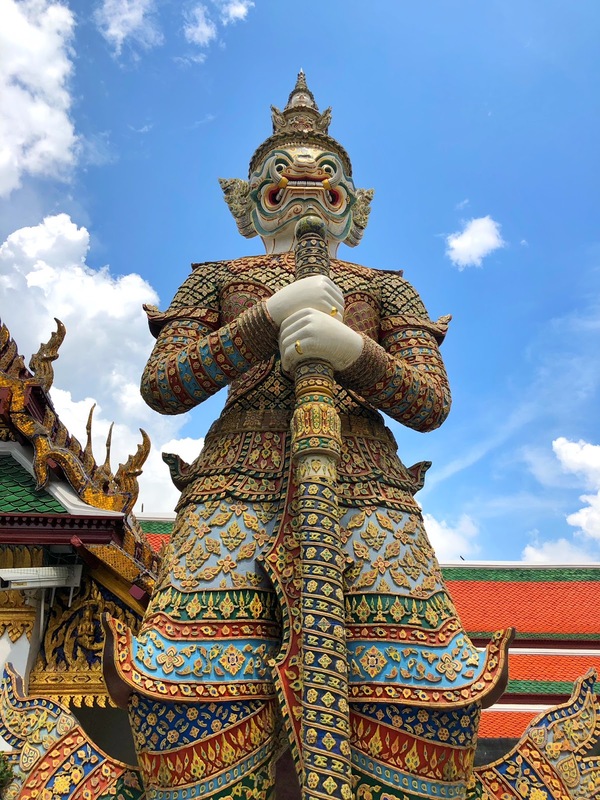 Depending on the temple, Men either have to have long pants or are OK in shorts. Be sure to do your research prior to heading out. However, if you forget, they all have sarongs you can rent. We could have easily fit a fourth temple in our day, but we hit a brick wall. After dinner, we couldn't pay our checks fast enough. I was so thankful for the Grab app. The one time we tried to use a taxi, the driver had no idea where I wanted to go as we were staying at a condo, not a hotel. If you find yourself in this situation, have your host write down your address in Thai, something I wish we would have done.